BBQ Meatloaf has always been my go-to meatloaf recipe. It has been a year since I’ve made this wonderful meatloaf recipe because I’ve been so busy trying out new recipes. I wanted to update the pictures so you could get a better idea of what this great meatloaf tastes like. 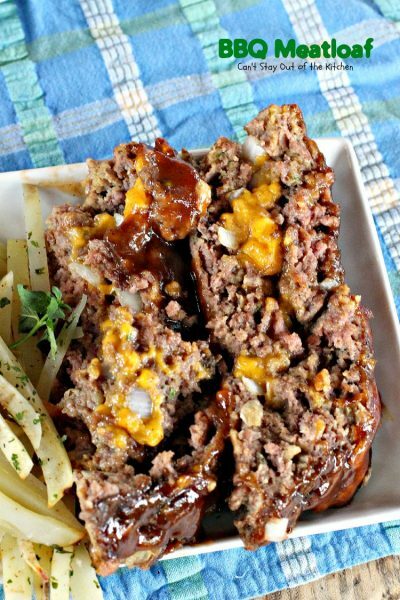 BBQ Meatloaf is stuffed with cheese in the middle and coated with barbecue sauce on top. Sweet Baby Rays or any other good barbecue sauce works very well although I usually try to get a sauce that doesn’t have high fructose corn syrup. BBQ Meatloaf has excellent, savory flavors with just a touch of sweetness from the barbecue sauce. It’s also incredibly easy to make. 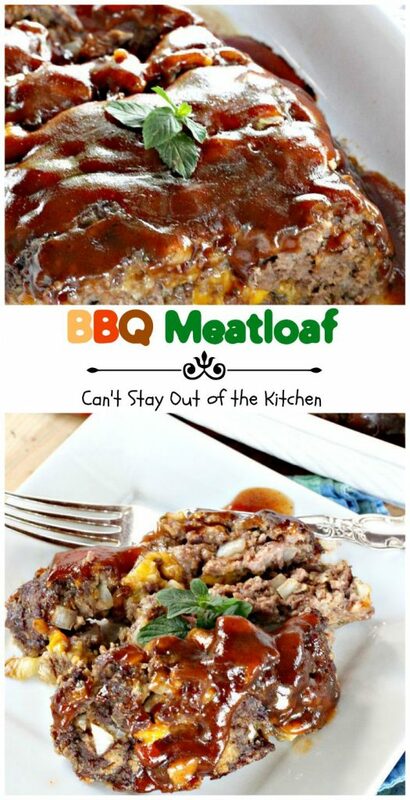 This amazing meatloaf recipe is the very first recipe I ever collected! It has 6 ingredients–5 if you leave out the cheese in the middle (I make it either way). I’ve always liked it because it has BBQ sauce on the top instead of ketchup or tomato sauce. I collected it from Rodger Justice who was a guy I worked with on monorails at Walt Disney World back in the mid-1970s. I remember talking to Rodger one time about my lack of cooking skills. He loved to cook and offered to give me recipes. (We were probably 18-20 years old at the time). He gave me this recipe and I wrote it straight into the beef recipe section of my Fanny Farmer cookbook. I used my Fanny Farmer Cookbook extensively after my sister gave it to me when I first moved out on my own after graduating high school. 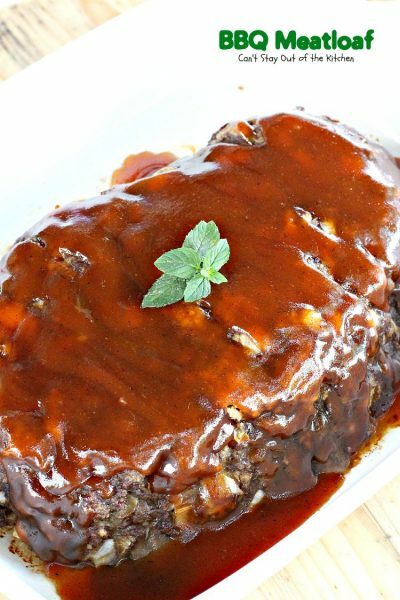 And Rodger’s BBQ Meatloaf recipe was a recipe I used all the time because it was inexpensive and our family just loved the taste of this meatloaf. 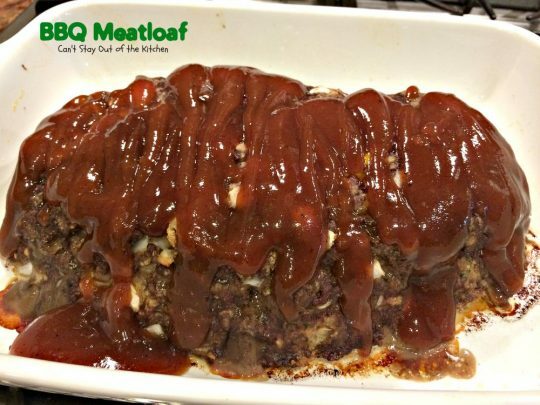 Collecting Rodger’s BBQ Meatloaf recipe began my venture as a “recipe queen.” I have made this meatloaf recipe hundreds of times over the years. I have made it for our family and I have made it for company. 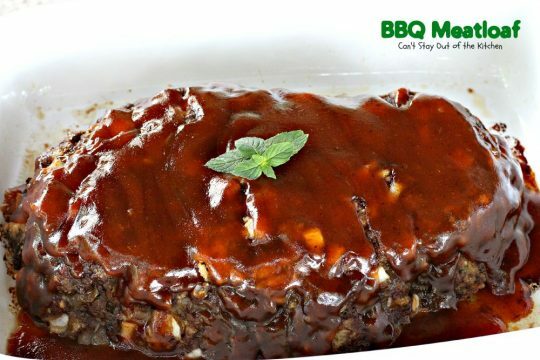 The BBQ sauce gives it such a tasty flavor and provides a little different taste than traditional meatloaf recipes do. Our family has always loved this meatloaf recipe, and I think you will enjoy eating meatloaf this way, too. When I initially posted this recipe in July 2012 I had just begun my blog about six months before. The original pictures were with an iPhone and were a little blurry. I retook the pictures a year later after I purchased my new Canon camera. I still wasn’t super happy with the pictures so I retook them a third time (July 2015) when I made this favorite meatloaf recipe again. I served it with Cajun Fries and fresh fruit. It’s still as yummy as the first time I made it almost 40 years ago! Meatloaf gets a bad rap a lot of times–and rightly so. But BBQ Meatloaf is delicious! Using a higher quality beef really helps make this meatloaf special. Lower qualities of beef have too high a concentration of fat so the cheese leaks out of the meatloaf rather than staying sealed inside really well. 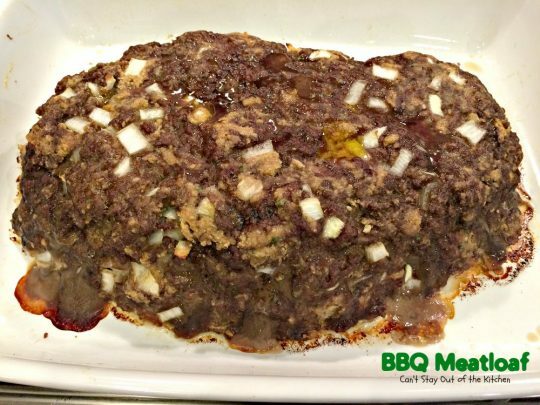 BBQ Meatloaf is one of our favorite meatloaf recipes. 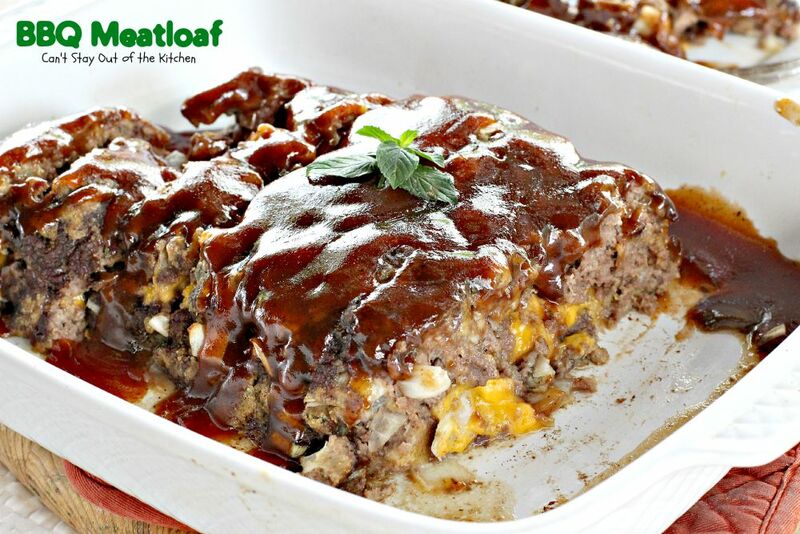 Between the cheddar cheese and the barbecue sauce, this meatloaf recipe is anything BUT plain and tasteless! Place ground sirloin or ground round in a mixing bowl. The higher qualities of beef will produce a lot less grease so the cheese won’t escape out of the sides of the meatloaf as easily as if you used plain ground beef or ground chuck with higher concentrations of fat included. Add eggs and bread crumbs. I have used Homemade Bread Crumbs in the past, which are coarser than the fine bread crumbs out of the can. Add diced onion. Combine ingredients mixing well with your hands. Spray a glass baking dish with cooking spray. 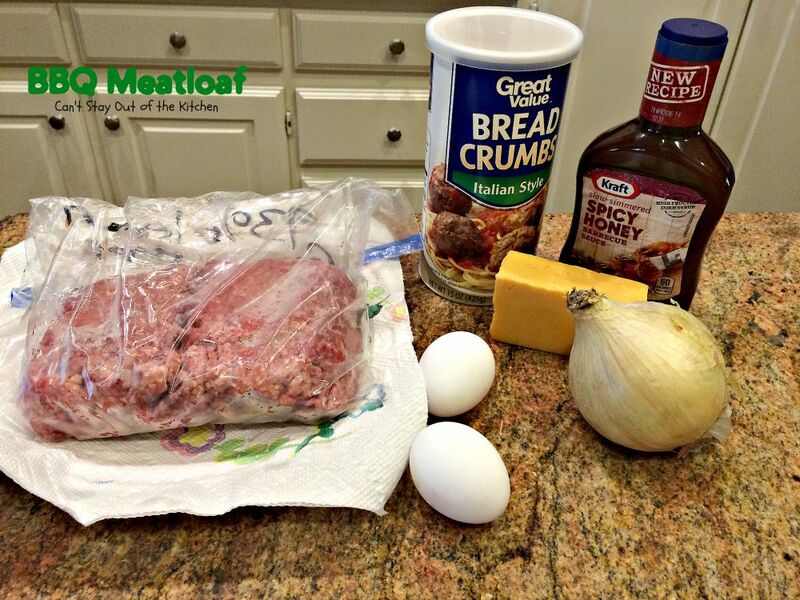 Form about one-third to one-half of the meatloaf mixture into a loaf with the edges built up about an inch or two. Sprinkle cheddar cheese in that hollowed out area. 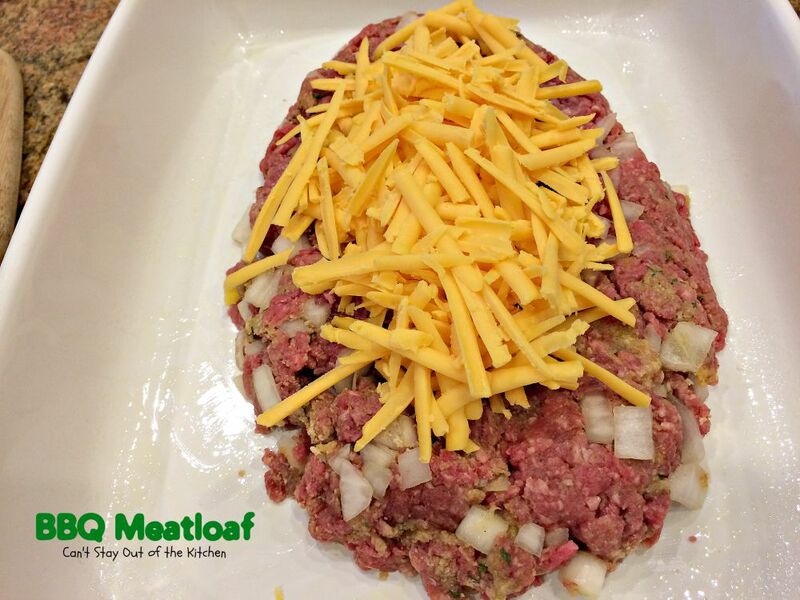 With remaining meatloaf mixture, cover the top and sides of the meatloaf and shape into a loaf being sure you seal the meatloaf as well as possible so the cheese doesn’t leak out while baking. Bake one hour at 350. Drain any grease. Bake an additional 5-10 minutes until the BBQ sauce has warmed up. Serve meatloaf. This is really good with sides of Mary’s Potatoes or Garlic Mashed Potatoes, Corn Pudding or Carrot Casserole, and Homemade Rolls or Bread. Each slice of Rodger’s BBQ Meatloaf is filled with cheddar cheese. This savory meatloaf is one of the best you will ever eat. If you want a great tasting meatloaf, then give BBQ Meatloaf a shot. 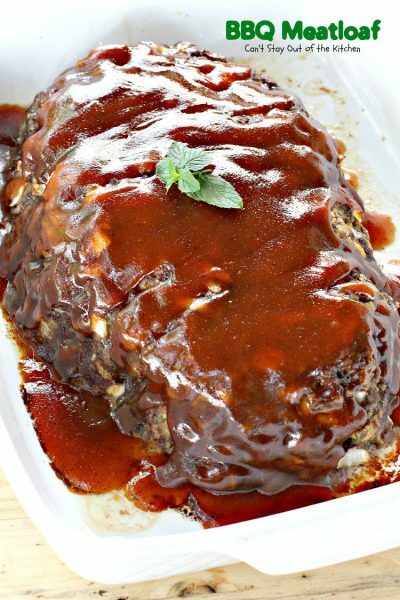 This scrumptious meatloaf is filled with cheddar cheese in the middle and topped with KC Masterpiece Barbecue sauce or Sweet Baby Ray's BBQ sauce on top. It's so mouthwatering. You can even use your own Homemade Bread Crumbs or gluten free bread crumbs, if desired. 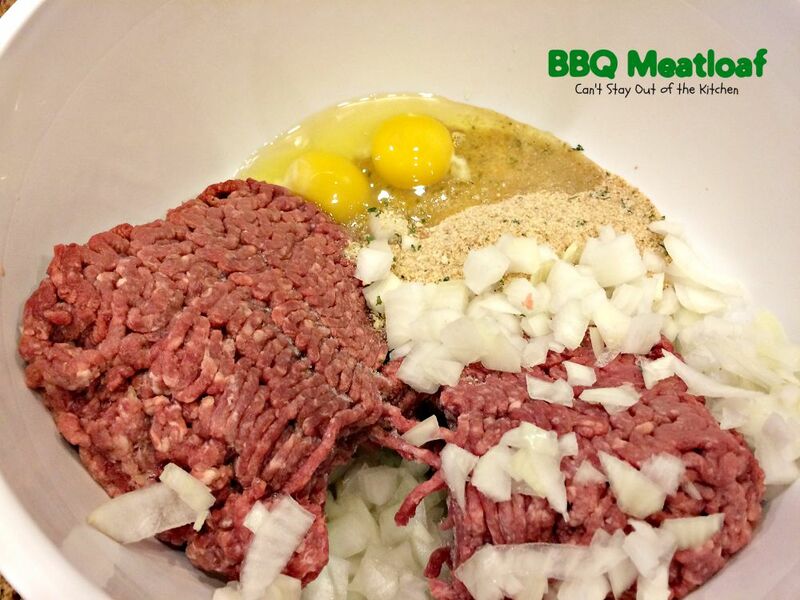 Mix beef, crumbs, eggs and onion. Place half of the meat mixture on bottom of dish and shape into oval. Sprinkle cheese on top of meat and press down (try to leave a 1-inch border). Place remaining meat on top and seal edges well so cheese doesn’t leak out while cooking. Bake 1 hour at 325° or 350°. 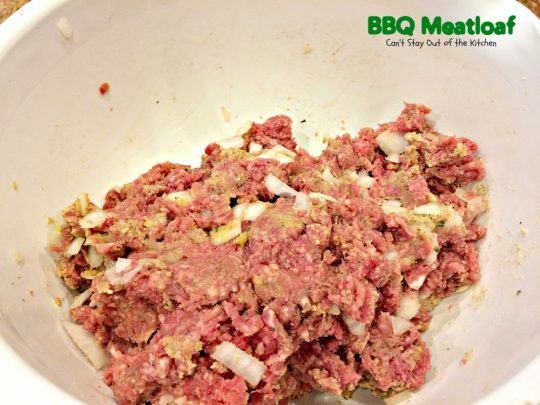 Spread barbecue sauce over top of meat and bake 5 minutes longer to heat sauce. NOTE: When I halve this recipe, I use 2 eggs. NOTE: I also occasionally add a 1/2 cup of milk over top of the bread crumbs when mixing all the ingredients together with my hands to soften the texture a little and enable the ingredients to mix more easily. NOTE: Homemade bread crumbs are made without preservatives and HFCS. NOTE: 4C brand has come out with gluten free bread crumbs. I purchase them at Walmart. 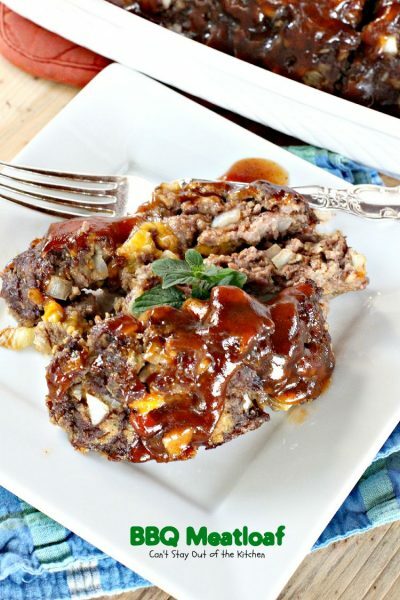 This scrumptious meatloaf is filled with cheddar cheese in the middle and topped with [url href=”http://www.kcmasterpiece.com/recipes/” target=”_blank” title=”k c masterpiece bbq sauce”]KC Masterpiece Barbecue sauce[/url] on top. It’s so mouthwatering. You can even use your own [url href=”http://cantstayoutofthekitchen.com/2013/07/14/homemade-bread-crumbs/” target=”_blank” title=”homemade bread crumbs”]Homemade Bread Crumbs[/url]. I halve this recipe a lot using 2 eggs. [br][br]I also occasionally add a 1/2 cup of milk over top of the bread crumbs when mixing all the ingredients together with my hands to soften the texture a little and enable the ingredients to mix more easily. 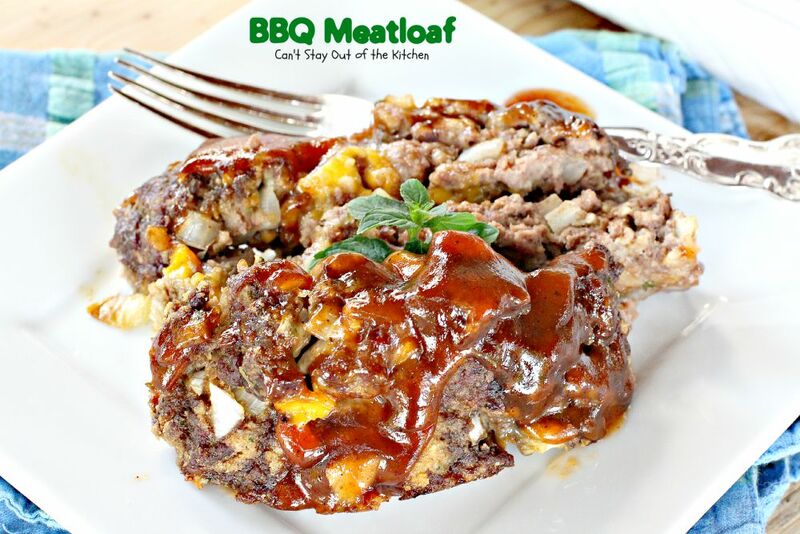 BBQ Meatloaf is so quick and easy to prepare. I like to make it for dinner with several other casseroles at the same time. Are you drooling? Go ahead and take the challenge. Make up BBQ Meatloaf sometime soon for your family!